[CONT](VC):Your units cannot boost this unit. [CONT](VC):During your turn, this unit gets [Power]+2000 for each of your «Shadow Paladin» rear-guards. [AUTO]:[Soul Blast (3)] When this unit is placed on (VC), you may pay the cost. 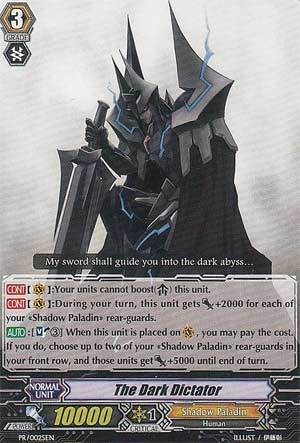 If you do, choose up to two of your «Shadow Paladin» rear-guards in your front row, and those units get [Power]+5000 until end of turn. Easily my favorite of the week, The Dark Dictator takes the stage! He's a puppet created by Phantom Blaster Dragon for the purpose of... being a figurehead? I forget exactly, but there's a degree of irony in that his presence only serves to make the Shadow Paladins more and more like the clan they're meant to oppose. How much more? Well, you can't get much more similar to Alfred than this guy. He can't be boosted, gains 2K for each of your Shadow Paladin rear-guards during your turn, and while he can't do any recruiting, he can distribute up to 10K to your front row when he comes down, in essence turning extra copies into miniature Soul Saver Dragons. It's a nice combination, though, allowing less card slots to be used while reaping all the benefits of the Royal Paladins... without actually using Royal Paladins. There's a beautiful synergy between The Dark Dictator, Macha, and Badhabh Caar. Once the field is full, Counterblasts can be spent on the likes of Gusion. Unfortunately, there's a bit of an inhibiting factor - Shadow Paladins at present lack any generic, beneficial First Vanguard, being railroaded into Fullbau and four Blaster Javelins for any possibility of gain. These don't really help your front line much, and your Grade 2 lineup gets bogged down by the practically useless Blaster Dark. Moreover, it's difficult for any Shadow Paladin deck lacking Masquerade to secure 18K columns. Give it time, though. The Dark Dictator will come to be terrifying once the inevitable Shadow Paladin reboot takes place. 3/5 (for now). Art-wise, he is clearly an evil, corrupt version of King of Knights, Alfred, and his skill mirrors as such. He had Alfred’s staple ability of being unable to be boosted, but gaining 2,000 Power for each <Shadow Paladin> Rear Guard you have. This puts him at a power cap of 20,000, in a time where Crossrides and 11,000 Power Vanguards are running rampant. Rather than retaining Alfred’s incredible skill to search the deck for almost any unit, he instead inherits a Soul Saver Dragon-like skill. When you ride him, you can Soul Blast 3 and give your front row Rear Guards 5,000 Power. Unlike Soul Saver, this is a much cheaper cost (as you will be able to pay it the very turn you would ride to Grade 3), and even if you are forced to ride him pre-emptively, he can hit just as good, if not better, numbers as Soul Saver can. The biggest problem for him, however, is that Shadow Paladins generally can’t optimize his skill very easily. Their Grade 2 lineup generally consists of multiple copies of Skull Witch Nemain (3,000 Power) and Darkness Maiden Macha (8,000 Power). Giving 5,000 Power to those units would almost be a waste, although Macha is capable of forming a decent powerline with Black Sage Charon. If Dark Dictator is your Vanguard, that means the deck won’t be able to run Void Knight Masquerade, who is generally their source of power in their Grade 2 lineup. Additionally, riding him for your final turn can be a bit of a gamble, as the highest level of power he can reach is 20,000, which does little to make an 11,000 Power Vanguard quake in its boots.